"We're nearly home, Louis. What can possibly go wrong now?" In the hands of a lesser actor, a set of false teeth might be a crutch to prop up a performance. But in the hands of Alec Guinness, such teeth could be used to create a full-blown character, adapting his face and his posture to match the comic mouthpiece. Such is the case in one of his later Ealing comedies, where he played the uncomfortably dentured Professor Morris, criminal mastermind. The Professor, head of a band of thieves, rents rooms from the elderly, somewhat dotty Mrs. Wilberforce (Katie Johnson). Under the pretense of playing as a string quintet, Morris and Major Courtney (Cecil Parker), Louis Harvey (Herbert Lom), Mr. Robinson (Peter Sellers) and Mr. Lawson (Danny Green) plot a daring robbery of an armored car. The genius of the plan is that the harmless Mrs. Wilberforce will unknowingly cart the loot out under the very noses of the police. All goes well until a mishap reveals the plan to Mrs. Wilberforce, and then the desperate gang must decide how to deal with her. But a single little old lady is more formidable than one might guess. "Droll" is perhaps the best word to describe this picture. While there are numerous opportunities for slapstick, they all occur genteelly off-camera. Rich in irony and with slightly black humor, the script is quite enjoyable. The humor is gentle throughout, with such smile-inducers as the fact that Mrs. Wilberforce never quite notices that the quintet (through the aid of a gramophone) keeps playing in full force even when three of its members are with her. Guinness is in fine form, utilizing the funny dentures to make his Professor Morris a slightly twitchy genius. 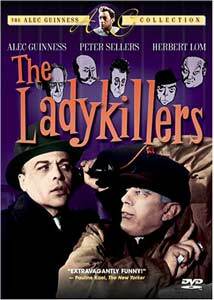 Herbert Lom makes a great impression as the sinister Harvey, who seems capable of anything. Peter Sellers, in his first significant screen role, doesn't display much of the versatility that he would eventually demonstrate, though his broad working class accent is convincing enough. But the real thief of the proceedings is Katie Johnson, who completely steals every scene that she's in, playing Mrs. Wilberforce with a shabby dignity that is endlessly appealing in its goodhearted sweetness. This probably won't appeal to Jim Carrey fans, but it's a worthwhile little comedy, from a different and calmer time, that's winning on its own terms. Image Transfer Review: This early British widescreen picture is presented in the original 1.66:1 ratio, in anamorphic mode. The transfer does it justice, with beautiful delineation and loads of detail. The color is the somewhat dull British version of Technicolor that one finds outside of Powell & Pressburger features, but it seems to be accurate enough. Skintones are reasonably accurate, though there is some variance from shot to shot. The source print is impeccable, without any visible frame damage. Audio Transfer Review: The 2.0 mono track sounds quite good, although it is beset with a persistent hiss typical of period British films. However, it's not terribly prominent and the dialogue is clear throughout. The Boccherini played on the gramophone sounds reasonably good as well, as does Tristram Cary's infrequently heard score. Extras Review: The sole extras are a trailer and the standard (but lengthy) Guinness bio with selected filmography. The trailer is also in exceptional condition, with color slightly more vivid than in the feature itself. Chaptering is quite good. Another droll Ealing comedy, in a fine transfer, with a few extras, makes for a fine disc reminiscent of a gentler era of comedy.